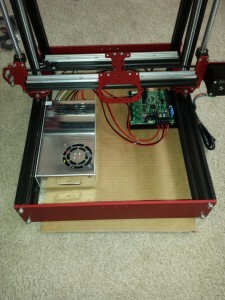 After speeding weeks looking over reviews and analyzing features I had narrowed it down to the Bukobot 8 from Deezmaker and the MendelMax 2 from Makers Tools Works. From the beginning I had always like the MendelMax for its rugged design and large printing area, though I was also very hesitant about it. 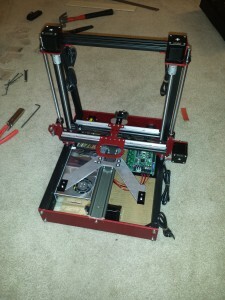 For being an RepRap based printer design there were not many reviews to be found and the user community seemed small. 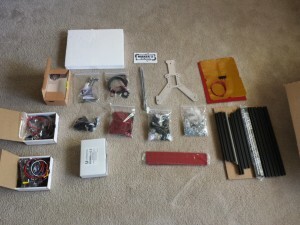 This could be on account of its cost being outside of the general hobbyist range of affordable at $1595. The one glaring negative was from Make Magazine in its Ultimate Guide to 3D Printing 2014 put the MendelMax 2 in the “Buyer Beware” category, only saying that printers in this category came damaged or nonfunctional. Despite the negative review from Make Magazine and small community there was still enough of a good vibe about the device that I finally came to a decision and ordered one. After ordering the MendelMax 2 it took roughly 3 days to ship and I received the box, all 30 lbs of it, another 3 days later. Upon opening the box everything inside was nicely boxed, shrink-rapped or bagged if one form or another and all the empty spaces filled with packing foam. The glass for the heated bed was nicely packed between two thick sheets of foam and taped to prevent it from escaping. 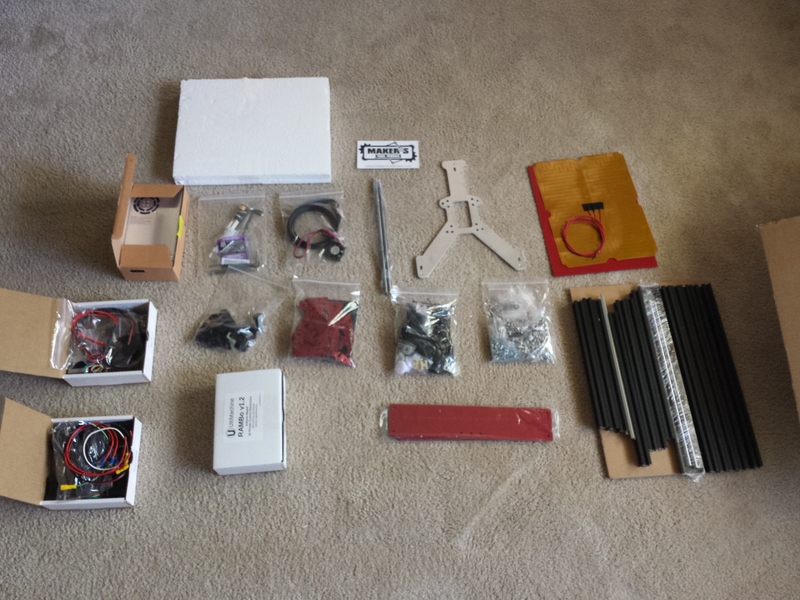 The kit came with hex keys and wrenches of various sizes, which was just about everything needed to assemble it. Beyond that all I needed was a small screw driver, a pair of cutters and a combination square, though any square will do. While assembling this thing I was pulling all the parts listed in the parts needed at the beginning of each section of the Hardware Assembly Guide. I quickly came to realize that this list was not always 100% correct which was somewhat of an annoyance. 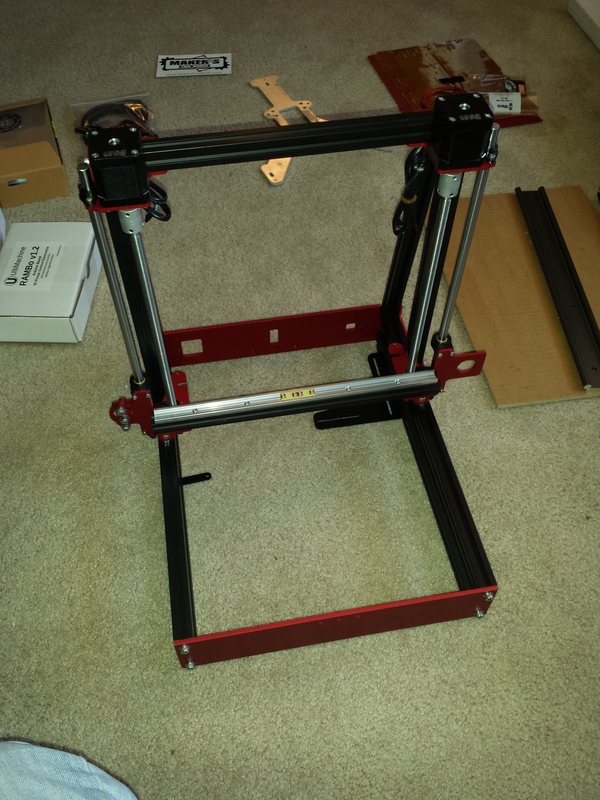 If its not already obvious I will note that this is the first time I’ve assembled a 3-D printer or anything resembling a 3-D printer. So this review will be from a point of view of someone who’s only previous experience with 3-D printers was watching some at a local maker fair. While I say this, I would not suggest attempting to building one unless you had at least a little practical knowledge of mechanics, robotics, or something similar. 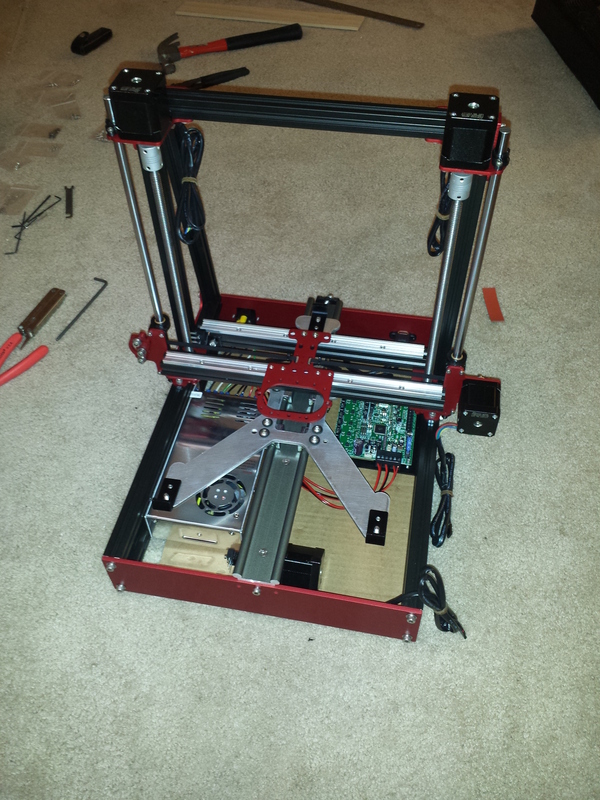 The Frame Base and Top went together rather quickly and without any major issue. While assembling these two sections I found that some of the T-nuts were harder to slide into the extrusions and others were so tight it took a hammer to gently tap them into place. It looked like when the T-nuts were cut from a larger stock there were burrs left on the edges which prevented them from easily being slid into the extrusions. I later went through and ended up filing these edges down on all the T-nuts to make assembly and alignment easier. 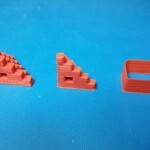 It is critical that these two sections are aligned and square as perfectly as you can manage as these form the main structure for the printer and that any misalignment here could cause larger issues later on. 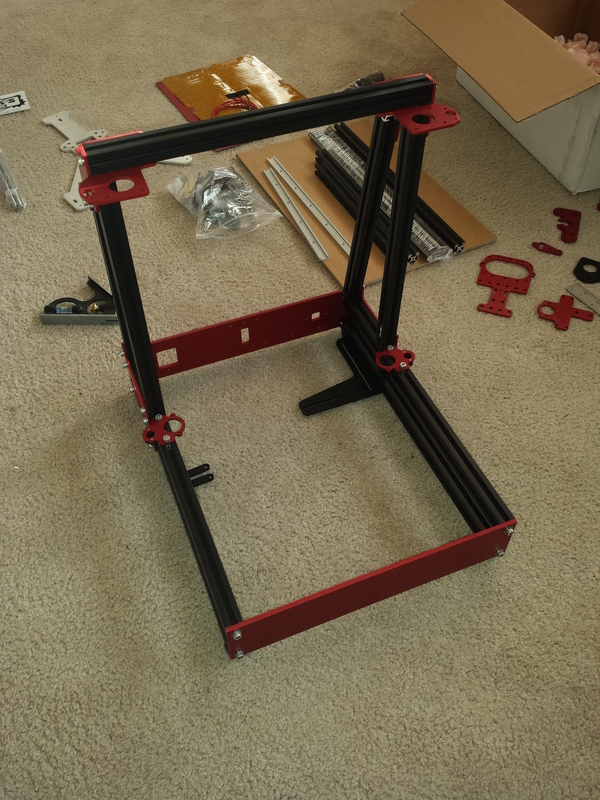 One final note on assembling the frame, I would suggest that T-nuts be added at this stage for a spool holder and graphical LCD. Even if you don’t plan on adding them on now or possibly using different ones, they will still need to be attached somehow and adding the T-nuts now will prevent you from having to take apart the printer to add the T-nuts at a later date and risk tweaking the frame out of whack. 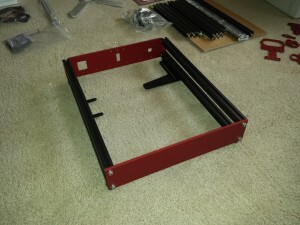 I will mention that once this thing is fully assembled and all the nuts and bolts are properly tightened it is solid. I have moved it around, bumped into it and leaned on it and it has taken the abuse without breaking or needing to be adjusted. 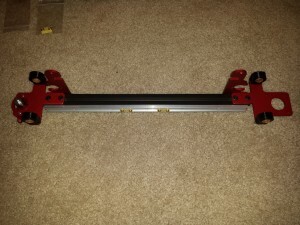 The X-axis is another critical section of the build, as mentioned in the instructions, you want to make sure that the bushings are properly broken in and aligned before moving on. In the assembly guide it says to use a pair of pliers to move the bushings around on the linear shaft but I found it easier to do this once the bushings were already in the Printed Bushing Holder Block, which took a small block of wood and my trusty hammer to tap them all the way in. Probably the most critical section and where I spent the most time on a single section was aligning the Z-axis and this was also for me the most frustrating. The instructions for this section give general guidelines on the alignment but I quickly found out that tweaking the alignment on one thing cause another to get misaligned and I found that the process of alignment mostly came down to guess and check. In the end I spent an hour or two getting the alignment as perfect as I could so that the Z-axis runs smoothly on the linear shaft without binding. From my experience so far, aligning the Z-axis and leveling the bed will be the two things that need tweaking most often. After installing the hot-end I once again had to loosen up the Z-axis and realign it to stop it from binding and causing the linear shaft to move up and pop out of the Z bottom brackets, this also occurred when installing the T-nuts for the graphical LCD. I found that it was critical to ensure that the Z-axis was being equally supported by the Z-axis lift mechanism (Z Isolator). This can be adjusted by holding one of the Z-axis lead screws and turning the other until the weight on the two Z Isolators is about even. 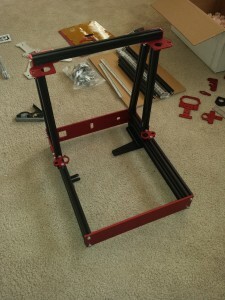 The rest of assembling the frame and major components went rather smoothly though I had one potential concern when connecting the belt for the Y-axis. On the back of the base there is a cutout for the belt to go out the back and around the tensioner and then back around to the motor. Once assembled the belt was very close, less then a millimeter, to the top of the notch which I feared could potential rub and wear out the belt prematurely. Upon writing this review I realized that I installed a bracket upside down which caused the belt to be closer to the edge then it should be. When installing the belt for the X-axis the assembly guide mentions that a properly tightened belt would vibrate at a frequency of 130 to 150 Hz and that you could use a piano to tune this. While I didn’t have a piano I did have a cell phone and went with the second option of using a spectrum analyzer app. This sounds great in theory but I found it almost useless as the mic barely picked up the frequency of the belt over the background noise and never gave consistent readings. Now thinking back on this I should have downloaded a piano app and used my much more sensitive ear to determine if the vibration of the belt matched the proper note. 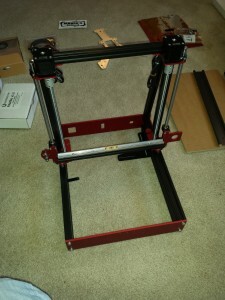 By this point I had spent a little over 13 hours assembling my MendelMax 2 and was ready to begin assembling the hot end. When I ordered the MendelMax 2 I decided to go with the all metal E3D over the J-Head hot end. I made this decision after reading some reviews knowing that the E3D wasn’t great for PLA but worked wonderfully with ABS because I knew at some point I would switch to printing mostly ABS but wanted to get my feet wet and learn the quirks of 3-D printing with the PLA first. When I received the parts I had not paid too much attention to the details of the hot end, only that it was there. Now upon a closer inspection I noticed that the arm for the filament idler was missing from the kit and that they had sent me the completely wrong hot end. I opened a support request with Maker’s Tool Works and they quickly sent off a idler arm to me. The support group also questioned my choice of the E3D hot end since they had seen that I also ordered some PLA filament along with it. 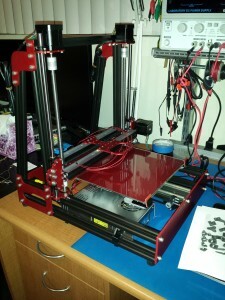 Noting that they “don’t recommend the E3D for PLA, it is very difficult to get running in our almost 300hr of testing”. The last thing I wanted to was to struggle to get the printer working so I ended up taking their suggestion and kept the J-Head and am glad I did so. I then spent the next week finishing up assembling the rest of the hot end, wiring up the motors & heated bed and doing some cable management. I also spent this time to make an insulator for the heating heated bed out of some foil, cardboard and glue. I later removed this because it was causing issues when trying to level the bed due to the level screws compressing cardboard. I will most likely try again with something more ridged like wood or Lexan, if it can handle the heat, when I switch to ABS. 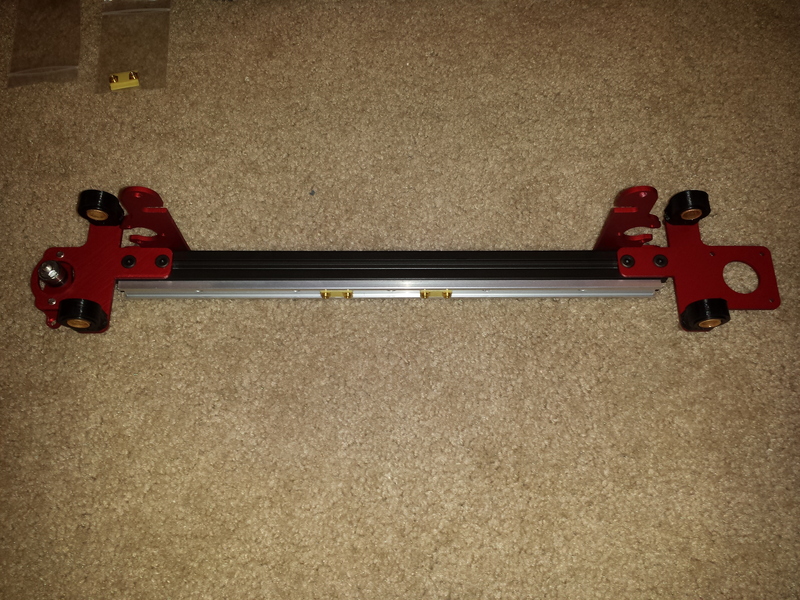 After about a week I received the idler arm and had it installed shortly thereafter. 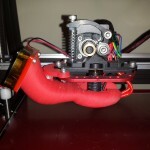 I was then going to fire up the printer and do the hot end PID tuning, extrusion tuning and heated bed PID tuning, as suggested in the Electronics Guide, before doing an actual print. 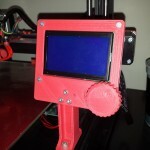 After powering up the printer and connecting to it with my laptop I commanded the controller to run the PID calibration. The commanded temperature of the hot end went up to 100 C and the actual temperature went nowhere. After checking that the temperature sensor was correctly attached to the hot end, the heating cartridge was plugged into controller and the the fuse on the controller was still good I check the resistance of the heating cartage, which read open. I once again open a support ticket with Maker’s Tool Works and after roughly another week I had a new heater cartage. After installing the new heater cartage I again powered up the MendelMax 2 and ran the suggested hot end, extrusion and heated bed tuning commands, this time without any issues. After entering all the correct values for the PID and extrusion parameters into the firmware I compiled it reprogrammed the RAMBo board. It was now time to level the bed. The Hardware Assembly Guide assumes that your first time leveling the bed will be without end-stops, though as my kit came with printed end-stops this was not the case. To level the bed I followed the instructions provided except that I first adjusted all three of the leveling screws to their mid-point and then adjusted the Z-Axis end-stop so that the middle of the bed was at roughly, or maybe a bit lower than, the correct height. This seems to have worked well and was not too much more trouble then what was described in the instructions and I have stuck with it. For my first print I decided to go with something simple that I could get an idea of what the quality would be. 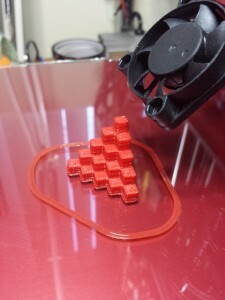 I downloaded a calibration cube off a Thingiverse and using the suggested setting for Slic3r generated some g-code. I later realized I could un-comment the home all axis command as I had the end-stops installed and did not need to worry about running the head crashing into things because it didn’t know when to stop. My first print of the calibration cube, with 0.3 mm layer height, came out as expected, there was a little sagging in the overhangs and the top few layers where not a square as they should be but overall I was happy with the print quality, especially for not having spent any time fine tuning the print settings. I quickly got ambitious and decided to a fan mount / duct for the print head rather than continue to use the zip-ties I was currently using. After three or four prints where the filament failed to stick to the print bed I realized that I needed to tweak settings or find something to help the filament stick. I started out adjusting the bed temperature down 5 or 10°C to see if the print stuck better, but that did not seem to do any good. The next thing I tried was blue tape; this was enough to allow me to print the fan duct but was only marginally better than nothing at all. I still needed something better. One of the things on my list of things to try was spraying the bed with a thin coating of hair spray. For my first test of this I only had hair gel handy so I gave it a try. The gel had not gone on as evenly as hair spray would have and there where drops of it splattered all over the print bed but it had worked. I quickly went out and bought a container of the cheapest “extreme hold” hair spray that I could find and have not had any issues since. I now clean off the print bed with some rubbing alcohol every dozen or so prints and apply a new thin coat of hair spray. The “extreme hold” might have been overkill as now, even once the bed has cooled down, I occasionally need to pry the printed object off the bed. 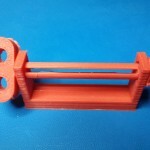 To ease printing larger items, with longer print times, without having to watch the spool of filament I printed a spool holder specifically designed for the MendelMax 2 from Thingiverse. It mounts to the top printer and used some bolts and skateboard bearings purchased from the local hardware store to hold the spool in place and allow it to spin freely. 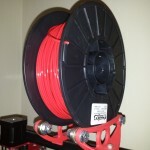 Even though this is the only spool holder that I have tried, I am happy with my choice. The only downside I can see is that if you often switch between different widths spools of filament you would have to adjust the width between the two arms each time. Another accessory that I bought / printed to ease the limited space on my workbench while printing was the Graphical LCD Controller, also purchased from Makers Tool Work, though available elsewhere. I purchased this because I wanted to be able to have the MendelMax setup off in a corner where, when I needed it, I could quickly turn it on and print without the necessity of having a computer attached and on the entire time. The LCD was around $80 including the required adapter off of Makers Tool Works. This is where the suggestion to add T-Nuts during assembly comes in handy and illustrates just how perfectly the Z-Axis needs to be aligned. Because I didn’t install T-nuts for the LCD controller when assembling the printer I needed unscrew part of the base and Z-axis in-order to slide to T-nuts into place. While doing this I managed to tweak the Z-axis out of alignment and had then had to loosen most of the bolts on the X-axis and realign everything. The final accessory I would like, and that I still need to design, would be an on off switch mounted on the side near the power supply. As mentioned above I have the printer stashed in a corner out of the way and the back of the unit is not easily accessible to plug and unplug the power cord. One of these days when I have some free time I will get around to designing one, unless someone beats me to it. Even with the problems I had with wrong, missing or broken parts I will say that the support team a Maker’s Tool Works was always very proactive and quickly handled the support requests. They also responded to my email and had replacement parts in the mail within a day or two of opening the request. 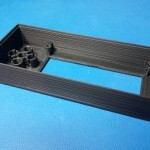 I have been quite satisfied with my purchasing experience and have and will continue to purchase filament and other accessories for the MendelMax from them. The overall build experience was not far off what I was expecting, yes the instructions could have been a little clearer in a few places but they were not overly complicated and even if you didn’t know what you were doing or what things are called there are enough pictures to follow along, plus there is always Google and the forums. Obviously being a kit there is assembly and calibrating required and being an open source printer based on a Mendel design it might require a little more TLC to get started but once tuned it works great. I am also glad that I got the kit, yes it is cheaper but I also wanted the experience. Building the kit has allowed to see how all the various motors, supports, belts, etc interact and I feel that I have a much better understanding of what to do when something goes wrong than I would have if I had purchased a pre-built printer. 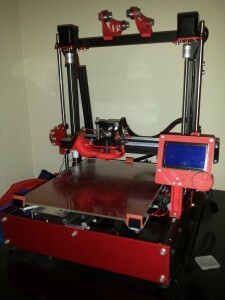 By the time I got around to writing this review I have now had the MendelMax 2 up and running for roughly 3 months and have been very satisfied with the results after print out dozens of things for around the house and other projects. Other than adjusting the layer height for varying resolution, once I had done the PID and extrusion calibration and some additional fine tuning later on I have been extremely satisfied and have not needed to fiddle around with the setting in order to get things to work. The only maintenance I have done is to dust it off once in a while and as mentioned before clean off the print bed and apply a new coat of hair spray every few prints. I imagine every six months or so I will go through and make sure that all the bolts and nuts are tight and re-level the print bed just as preventative maintenance. So if you are looking for a well built 3-D printer that has a large print area, good print quality and is open source I would suggest the MendelMax 2.0 wholeheartedly. This entry was posted in 3-D Printing, Review and tagged 3-D Printer, Mendel, MendelMax 2 by Daniel. Bookmark the permalink. Thanks for the detailed review! 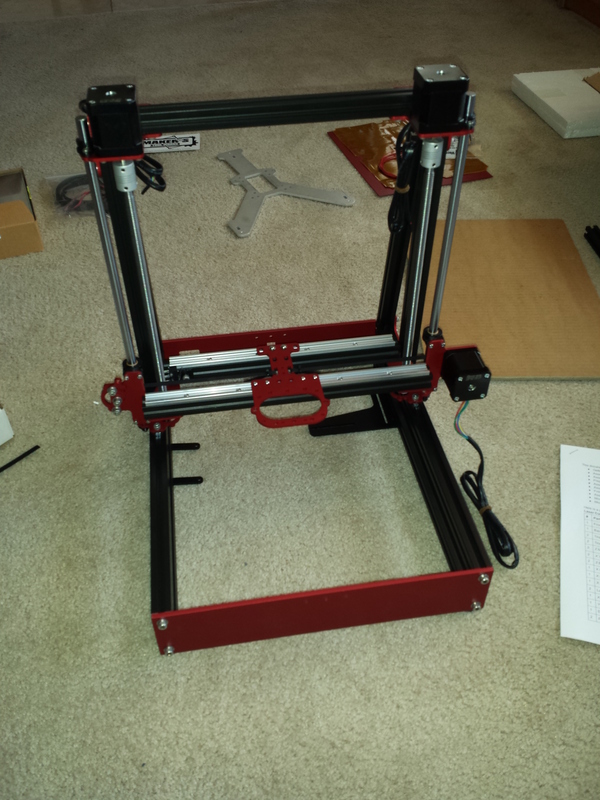 I recently finished building a MendelMax 2 too, except I did it from scratch because I wanted a much longer Y-axis. My experience was much likes yours, and it’s working pretty well. I bought 1200mm extrusions for the basic frame, and used a lead-screw instead of belt drive for Y. The bed, bed heater(s), Y stepper, and power supply had to be beefed up, but that’s about all that changed. Initial tuning is a pain, but as you noted the design is very solid, and doesn’t seem like it will need to be retuned often.